Suzuki has made only four XL7 SUVs this year in Canada. TOKYO -- Suzuki Motor Co. will make no more vehicles in North America this year, but CEO Osamu Suzuki says he remains committed to the CAMI venture with General Motors. 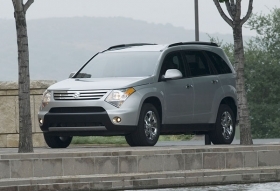 The Ingersoll, Ontario, plant had been making the Suzuki XL7 SUV, along with the Chevy Equinox and Pontiac Torrent. CAMI made 12,407 XL7s last year, but only four this year through Sunday. The plant is still producing the GM models. Suzuki has put further production plans on indefinite hold. Kojima said Suzuki hasnt decided when it might resume production at CAMI Automotive Inc., a 50-50 joint venture with GM that started in 1989. The mid-sized XL7 is the largest vehicle made by Suzuki and the only model built in North America. CEO Suzuki said he is confident the plant will stay open even if GM files for Chapter 11 reorganization. The Japanese automaker wants to continue its cooperation with GM, he added.